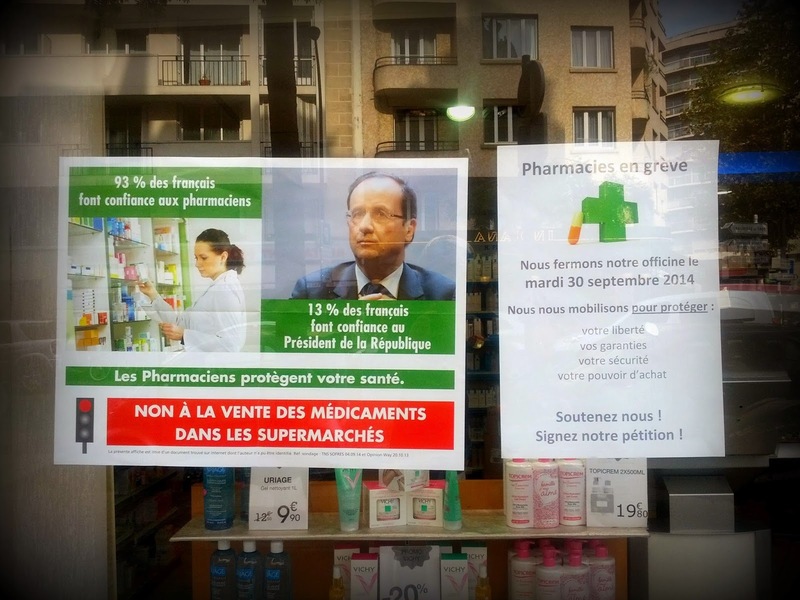 If you are in Paris today (Tuesday), don't be sick, for it'll be very difficult to get medicines! Why? Because most pharmacies will be on strike! Explanation: the medicine market is a monopoly in France (only appointed pharmacists can sell medicines), therefore margins are pretty high. Pharmacists are afraid that if non prescription drugs are sold in supermarkets prices will go down and they will lose a lot of money (which is probably true!). I understand their point of view, but as a consumer, I could do with a little drop in prices! Prices for prescription drugs are high here too. I'm always amazed by the cost of medical treatments in the US I must say. Medicine (OTC) tend to be cheaper in the US though (especially things like paracetamol). A strike is so very French. I hope no ill people die because of the strike. No... And there will still be a few open pharmacists. I get 500 pills of ibuprofen at Costco in the USA at the equivalent of 5.25 Euros. Try that in France. [Last time I checked, it was about 5 Euros for 12 pills!] In summary, the cost of self-medicating is cheaper in the U.S. Yes, especially for some medicines like Ibuprofen or Paracetamol which are extremely expensive here. Not really, I'm sure the French would do the same if they could. French pharmacists argue that they give advice when needed (which is true), but I suppose you can also get advice at CVS or Rite aid in the US) and that they "protect patients from themselves". Pharmaceutical companies, on the other hand, managed to lobby (it is forbidden to sell boxes of more than 12 tablets of paracetamol or Zyrtec for instance!). Officially because it could be dangerous for patients, but in fact it's because they make more money selling small quantities. Very interesting to learn about. I hope no one is harmed because of inability to get needed medication.